CNS Keshet – You Are Welcome Here! Congregation Neveh Shalom welcomes all LGBTQ individuals and all families with an LGBTQ family member. Join us at our Facebook Group, or for more information please contact Mel Berwin at mberwin@nevehshalom.org, or Liza Milliner at lizam410@gmail.com. CNS Participates in Portland Pride Parade! 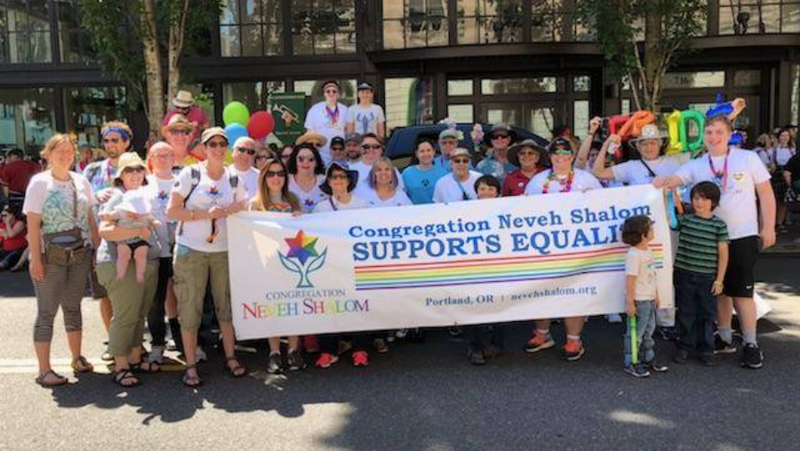 Each year CNS participates as part of a larger community contingent called Jewish Pride Greater PDX. We have our own CNS banner and Pride t-shirts and invite all who would like to march with us to join in the celebration! For more information, please contact Beth Milliner at 540-819-1807. Buy a T-shirt and/or Support the Cause! Whether or not you’re marching with us, help support the message of CNS as a welcoming community by buying our “All Are Welcome T-Shirt”, or donate to our new CNS Keshet Tribute fund! T-Shirts have a rainbow pattern CNS logo and the message “All Are Welcome”. Email Liza at lizam410@gmail.com to reserve your size and complete your order. We have a tribute fund for CNS Keshet community activities such as Pride Parade and Shabbat dinners and other social/educational events of importance to our LGBTQ community of adults and youth. Contact receptionist@nevehshalom.org to make your contribution today!